The story from the sixth chapter of Pirkei Avot is familiar: Rabbi Yosi ben Kisma, a sage from the 2nd century CE, is travelling. A man greets him, and he returns the greeting. The man asks where he's from; R' Yosi ben Kisma replies that he is from a place of great scholars. The man offers him a great deal of money to come live in his town, and R' Yosi ben Kisma replies that no matter how much wealth he would receive, he would not live anywhere but in a "place of Torah," for wealth is only of value in this world, but Torah remains with us. The classic question: Does this mean that rabbis should not go live in small towns? What of outreach, and bringing Torah to those who are not fortunate enough to live in a place of many teachers? Was I wrong for going to live in Allentown all those years? Who should teach in schools in some communities, and who should lead their shuls? Rabbi Yosi ben Kisma does not actually decline to live in his interlocutor's community; he only preaches on the value of Torah over money, a lesson which is consistent with the themes of Pirkei Avot. "I may well go with you," Rabbi Yosi ben Kisma says, "But not on the basis of the money you offer. I will go only if it is a place of Torah." This then resolves the conflict of the small-town Rabbi - he may go to a place which is focussed on being/becoming a place of Torah. In this school of thought, R' Yosi ben Kisma indeed declined, but it was not because he rejected outreach. Rather, it was because he discerned some impropriety in the man's request for him to come live there. Perhaps it was that the man only wanted him to live there, but did not ask him to teach Torah. Or perhaps it was that the man thought money could buy Torah. And so R' Yosi ben Kisma decided that in this particular case, it would be inappropriate to move to the town to engage in outreach. Rabbis who are recruited on proper grounds, by good people, certainly should go to small towns. Either because he did not believe in the value of Outreach in general (an argument I first heard this Shabbos, and one that requires some thought), or because he was concerned about his own deterioration if left on his own, R' Yosi ben Kisma felt that the price he would pay in going to this man's town to teach Torah was not justifiable. Similarly, rabbis should not go to smaller communities if they will lack colleagues with equal Torah training. • Your focus and time allocation are framed by local needs [chesed, shiurim, psak, officiating, counseling, administration] without the input of the world of scholarship. To me, this means that rabbis in smaller Jewish communities need to find a way to import peers, or to test and sharpen and emphasize their learning with colleagues from afar. There must be a challenge that regularly takes them out of their normal environs, giving them a new goal to pursue and a new horizon to attract their vision. With this stimulation, the Rabbi will benefit, and so will the community. I've written a lot on this blog about Moshe Rabbeinu – twenty posts, according to this link – but I must admit that as fascinated as I am with Moshe's leadership, I might admire another Jewish still more. That's Moshe's father, Amram. Certainly, Moshe's forty years at the helm were an impossible feat; the fact that he stood up to Pharaoh, then held a nation of a few million former slaves together and on-task for so long, is astounding beyond words. But consider that when Moshe needed it, there was always a miracle available for him. Need food? Bread from the sky. Need water? Right here, from this stone. Enemies pursuing you? Not a problem - clouds, outstretched hands, whatever it takes. On the other hand, Amram led with nothing of the sort supporting him. Sotah 12a tells us עמרם גדול הדור היה, that Amam was the leader of his generation. How do you lead a nation of slaves, while they are still enslaved to the most powerful empire around? What does leadership even mean in such circumstances – do you reassure them that everything is going to be okay? Do you find some way to manage the needs of the population? Do you petition the merciless throne for relief? One thing's certain, based on the scriptural and midrashic record: Amram had no miracles, no magic stick, no clouds of glory, no Mount Sinai revelation. All he had, to inspire and judge and feed and clothe and guide, was his faith and wit and personality. Moshe will always be a role model for anyone, and certainly for a leader, but it seems to me that for today's Jewish leader the more accurate model is Amram. No Divine messages, no sound and light show, just faith in a tradition, courage to burn and hope for tomorrow. On a separate note, Amram and his wife Yocheved must have been some parents. Yocheved, daughter of Levi and holdover from the age of Matriarchs and Patriarchs, and Amram, listed in Shabbos 55b as one of a few people who never sinned. The two of them produced Miriam, Aharon and Moshe… Wow. Like his famous son, Amram didn't live to see the full fruit of his labors. As calculated by Rashba (Bava Basra 121b), he died at least 56 years before Moshe came back to redeem the Jews. What a terrible thing, to manage all of those struggles, to conceive the redeemer, but not to see the end. What an awe-inspiring human being he must have been; I wish we knew more about him. ...I hope that revelation doesn't burst anyone's illusions about me. When is it better for a rabbi to hold his tongue? A common rabbinic question: When is it better to speak up, and when is it better to say nothing? If you know that people are doing something incorrectly, is it better to sermonize on it and get some to listen, knowing that others will then ignore your counsel and break the law knowingly? Rav Moshe Feinstein dealt with this question in terms of calling for silence before shofar blowing, and I have translated the bulk of his responsum (Igrot Moshe Orach Chaim 2:36) below. I particularly like his last suggestion here – that there is a third choice, separately notifying those who will listen. This requires more work, of course, but that's an important point: Often a rabbi can do better for his community by putting in the extra work. Regarding the matter of whether to announce before shofar blowing that one may not interrupt verbally until after the "standing blasts" [the second set of 30 blasts, blown during Musaf], in a shul where many simple people daven and it is known that they will not listen to the announcement, and they will interrupt. One person contends it would be better not to announce this, so that the people would sin accidentally rather than intentionally. His honor [the letter-writer] responds: Should we fail to teach the general population any laws because of such a concern, saying regarding them, 'Better that they sin accidentally'? The principle of 'better that they sin accidentally' applies specifically where people definitely will not accept, as seen in Tosafot Bava Batra 60 and Rosh to Beitzah 30. We should not teach such people. The question of how we could refrain from teaching is not difficult; since they definitely would not adhere even were they to learn it, there would be no benefit in teaching them. However: If it is unclear that they will not accept the law, we definitely are obligated to protest their conduct, and all the more so to teach them outside of the time when this violation is occurring. It also appears obvious that if the population includes people who will listen, one must inform them of the prohibition – even if it is known that some will not listen and will violate intentionally. We do not harm those who would accept the instruction in order to avoid harming those who will violate the law intentionally and be punished as intentional sinners. Were we not to inform these people, they would violate accidentally, which would also be a legal violation, causing harm. Therefore: In a shul which may include people who do not know the prohibition against interruption, and who will interrupt [the shofar blowing] and accidentally break the law, but who would listen if it were announced and would not interrupt, we must announce the law unless there is a way to convey the information to those people individually. If it is known that no one is present who will accept it, or if there is some way to inform only those who might listen, then we should not announce it. וקצת יש להסתפק בדין זה דאסור להפסיק גם אחר תקיעות דמיושב עד שיגמור תקיעות דמעומד שלא ברור האיסור דהר"ן בשם בעה"מ סוף ר"ה הקשה ע"ז דמידי דהוה אמדבר באמצע הסעודה והובא בט"ז סימן תקצ"ב סק"ב והתירוצים דחוקים והר"ן מסיק דרק משום דהביא זה הרי"ף בשם הריש מתיבתא צריך ליזהר בזה עיי"ש, ונמצא שאף אם במזיד יפסיק בדבור לא יעבור באיסור ממש אפשר ליכא בזה משום מוטב שיהיו שוגגים וצריך להכריז. או אדרבה כשיכריזו שאסור ויעבור יהיה עובר יותר מצד מחשבתו שהוא יסבור שהוא איסור ממש, שיש ע"ז עונש אף שבעצם אינו איסור ממש כדדריש ר"ע בקידושין דף פ"א וכשלא יכריזו הרי יהיה רק שוגג בדבר שהוא רק חומרא בעלמא שאולי לא יענש ע"ז ואין להכריז, ואין בידי לע"ע הכרעה בספק זה. ולכן יש לעשות כדלעיל שאם אפשר שיקבלו איזה מהשומעין צריך להכריז שאסור להפסיק ואם ידוע שכל האין יודעין הדין לא יקבלו אין להכריז. ידידו מברכו בחג שמח, משה פיינשטיין. Bargaining is an automatic reaction to loss, as described by Elisabeth Kubler-Ross in her famous formulation of the stages of grief. Someone takes ill, and at some point he starts to think about what he could do differently, how he could improve, such that he would ‘deserve’ to escape this grief. For the non-theist the poker chips to be ante'd may include a better diet, dropping smoking, going to the gym, or perhaps creating a stronger positive karma - even after the cards have been dealt. For the theist, the options include religious improvement: I’ll give more tzedakah, I’ll learn more Torah, I’ll go to minyan. The semi-conscious theology is that the better I do, the less I’ll ‘deserve’ the loss, and therefore the loss will be reversed. Part of that reluctance is because this mitzvos-for-prizes approach feels like it cheapens religion; mitzvos demonstrate loyalty, they aren’t bribes. Yes, I know the Gemara (Pesachim 8a) that “One who says ‘I give this coin to tzedakah that my son may live’ is a צדיק גמור, fully righteous.” And I understand why that’s true. But all the same, my heart is with Antigonus of Socho (Avos 1:3); pledging mitzvos for rewards feels wrong. Another part of my reluctance is that the whole bargain is just so presumptuous. If I learn more Torah, then my relative should live? Rabbi Yochanan lost ten children (Berachos 5b); is my extra learning going to make me more worthy than Rabbi Yochanan? It’s like when people talk about having been saved from a disaster by a G-d-driven coincidence - what about all of those people who weren’t saved, were they not as worthy as you? So I just keep on doing the regular davening, dedicate a shiur for a refuah shleimah perhaps, and hope for the best. I've moved too many times. After a lifetime in one house, from pre-school through semichah (dorming doesn't count; neither do two years in Israel), I've lived in three cities, and numerous homes. 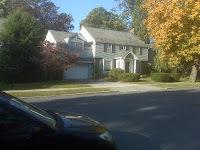 In Rhode Island, we had an apartment and then the first floor of a house and then the second floor of a different house. In Pennsylvania we had our one, beautiful, spacious home, for eight years; I still keep a picture of it on my cell phone. Here, take a look. It had a two-story library, 5 bedrooms, hardwood floors, double-sized yard, and three aravah bushes I planted. Here in Toronto we're in our third year in a rented house, and we know we need to move out at the end of this year. Where in town is as yet unresolved. I never wanted a peripatetic life. I always wanted to live in one place, be part of one community, preferably in Israel. The Israel piece didn't work out, for very good reasons that won't be on this blog. But I still wanted to be in one community, for the sake of my relationships and work, for the sake of my children and their stability. I've written about this before. But so it is, a life of transitions. I cope by trying to make it an experience of transformation, rather than mere transition, so that I have sense of going toward something rather than simply shifting locations. Every move should be adding something, broadening or changing me in some way. Picking up and moving is hard, confusing, alienating. If it happens without growth, it's just all of those emotions without any payoff. The newness of a place may relieve boredom, but that's about it for most people. We naturally need some fulfillment to go along with it. Biblically, Yosef's travels were supposed to teach him something, make him greater, transform him. It was more than a move to Egypt, to prison, to the palace; Yosef was to grow. And it worked, and he was patient and it paid off. On the other hand, the Jews' travels when they left Egypt were supposed to teach them and make them greater, and it didn't work. They were the same people, just in a different setting, and it showed as they travelled for 40 years largely without outgrowing their original problems. Frustration. And consequent disaster. The same applies to our many life changes – birthdays, marriages, bereavement, illness, job changes and so on. If we only transition, then we just get frustrated. We need to grow. So I need to keep asking myself whether I am transitioning or transforming. As a new year begins – I pick up our new Sgan at the airport tonight, and the new avreichim arrive in the coming days, and I'm planning new shiurim and chavrusos – I need to maintain that question on the front burner. Am I transitioning or transforming? And if it’s the former, how can I make it the latter? The other day I received one of those phishing emails, a message presenting itself as coming from a rabbinic colleague of mine, claiming that he had been mugged in Scotland and he needed $1850 to get home. The hacking job was sophisticated – when I emailed him to let him know his account had been hacked, I received an auto-reply indicating that he was in Glasgow. But the kicker was this sentence in the phishing email: "I would appreciate whatever you can help with , promise to refund you right as soon as I'm back home in a couple of days Be'H." Yes, the hacker included the classic acronym for "b'ezras HaShem", "with Gd's help", the sort of thing which a rabbi would write, and an observant Jew would recognize. Had the email been in his writing style and had the phish not been so routine, I might actually have believed this was real. This makes me wonder who is doing the hacking and whether rabbis are being targeted. Is the idea that rabbis are connected to lots of people, and that congregants would all want to reach out and help their rabbis? Or is it an anti-Jewish thing? And how did the hacker come to recognize this bit of Hebrew lingo as significant - is it just the Jewish equivalent of a Christian, Muslim, etc similar phrasing, and easily recognizable as such? Or is this hacker Jewish? •	Change your password after using your email on a public network, like a hotel or airport. Hackers may collect data and use it months later, so changing your password could render their stolen information useless. •	Create a backup email account, and set up email forwarding (Gmail does it for free) so that all email sent to your main account will also be forwarded to your backup account. This will allow you to continue to receive email sent to you, even if your account is hacked. •	Keep an address for a separate email account, which you check regularly, among your contacts. This way you will also receive spam/phishing emails sent from your account. •	Email providers often have you set up a backup email address, to which password information will be sent if you are locked out of your account. Check that address regularly; someone who hacks into your account may change that backup address. •	If you use Gmail, you can see a record of recent logins to your account (bottom right, "Last activity"). Check it regularly. •	Notify people when you will be traveling, so that they won't be fooled by phishing. Do these make sense? What else? Should my children bless the State of Israel? As early as I can remember, my family recited הרחמן הוא יברך את מדינת ישראל, "May the Merciful One bless the State of Israel," as part of Birkat haMazon (the blessing after meals). We did it just before the special הרחמן prayer for Shabbos, Yom Tov, or Rosh Chodesh. But this sentence is not part of the original, ancient Birkat haMazon; some time after 1948, someone decided to promote its insertion in a section which includes various blessings appended to Birkat haMazon in centuries past. I don't really know, but I think this recitation was part of a host of Religious Zionist practices embraced by a generation of post-1948 Jews raised in schools (Ramaz, Manhattan Day School, BTA/MTA, Yeshiva of Flatbush) and summer camps (Massad, then Moshava and Morasha) of that ideology. It went along with the Israel Day Parade, the goofy kova tembel and the love of Naomi Shemer. But back to the point: I don't see anything particularly non-halachic in this line. In some sense it even fits the second blessing of Birkat haMazon, which thanks Gd for the wonderful land, as well as the third blessing, which prays for the rebuilding of Jerusalem. Still, it does seem odd to me; I am not normally a fan of adding permanent tefillot. [I do believe in spontaneous addition in permitted ways, just not the enshrinement of the 'spontaneous' note in stone.] Also, mentioning the State rather than its citizens seems too political for a prayer. Bottom line: I continue to say it, since my parents do so and since halting my prayer for the State would feel wrong. Why wouldn't I convey this to them? Because it's not yet an established minhag in my family, because it still seems like an odd insertion, and because it would make them weird in a society which does not include this. I've done enough to make them weird; I don't think they need this as well. On the other hand, it's a prayer for something I value. And it's something I say, myself. Hence the problem. What do you think? I just spent a wonderful Shabbos in Calgary's Jewish community, enjoying the hospitality of a great shul and the warmest of families. I've never been here before, but it made me terribly homesick. Regular readers here know what I mean (and for those who don't know, try here, here and here for starters). My reasons for leaving the rabbinate to move to a community with a high school were real and legitimate and right, and I love what I am doing with the kollel in Toronto. I'm learning and growing, measurably. Nonetheless, two years down the road, being in Calgary intensified the emotions I have for Pawtucket and Allentown, and for the shul roles I held. The community - Toronto is great, on many levels, but most parts of it can't compete for warmth, for camaraderie, for the "ownership" sensibility of individuals, with smaller Jewish communities. During the past two years I've spent Shabbos in Hamilton and Ottawa, and now Calgary, and in these places I've seen again what I saw in my old stomping grounds – the people who live and love, and are engaged in building, a shul. A place to recognize Gd. A place to raise kids. A place to congregate and celebrate and commiserate. A place to learn and grow. It's funny to see people and think, as you look at them, of the people who played their roles elsewhere. To look at a gabbai and think of a gabbai in Pawtucket. To look at a person making announcements and think of a person making announcements in Allentown. Not that people are interchangeable - we bring our selves to what we do – but that these are the key roles which define Jewish community, like a baseball team has a shortstop and a hockey time has a right winger and so on. I naturally see a person playing a position and think of others I've known who have played the position on similar teams, elsewhere. It brings a powerful nostalgia. And the shul role - It also made me homesick because I had the chance to observe a shul rabbi who knows what he's doing; the Rav of the shul here in Calgary is first-rate. I am under no illusion that I was perfect in the pulpit, but I know what perfect looks like, in terms of the academic, intellectual, teaching role, and the intertwined human, social, engagement role. I love having the chance to watch shul rabbis do it well… and, again, it brings pangs of homesickness. There is no upshot here, no practical takeaway. Just some musings on a Motzaei Shabbos in the Canadian Rockies. I wrote this on the plane en route to Calgary, my first-in-my-adult-life long-distance trip just to see what's beyond the horizon. The feeling as the plane took off was unbelievable; more on that another time, perhaps. In a shul, the Rabbi has a certain communal standing, but that doesn't guarantee any sort of standing vis-à-vis the individual. Of course, some congregants naturally feel close to the Rabbi, but for most people the Rabbi must establish himself as a resource. You start with a blank slate (assuming an absence of baggage…), and there is no presumption of closeness or sympathy. Hopefully, over time and the course of many interactions, you gain legitimacy as both friend and leader. I am, by nature, geared toward solutions. I like to find the answers to questions, and to me the gauge of success is the quality of your conclusion and the speed with which you brought it to fruition. But that's not the way it works in a shul; the point is not whether the Rabbi is an out-of-this-world genius who can solve problems (although that is important, let's not kid anyone), but whether he wants to sit with you, however long, sympathetically discussing the problem. It really can be better to schmooze for an hour and a half before coming around to the right answer, even if you had a feeling that was the right approach from the start. Just because people live in the same area doesn't mean they are a community; shuls, regardless of their size, consist of multiple mini-communities, including communities of just one person. The challenge is to find the common denominators, the threads which weave people together, and use them to draw individuals into collectives. There's more, of course... for another time, Gd-willing. 1. The status of a Name written in a language other than Hebrew is not entirely clear; significant halachic authorities, such as the Tashbetz and R' Akiva Eiger, ruled that it is, indeed, invested with sanctity. A classic example is R' Yonatan Eibschitz's ruling that one may not write "Adieu". If you are interested in researching this, I'd be glad to provide references. Classic sources are the Shulchan Aruch's comments in Yoreh Deah 276 and the commentaries there, and Rabbi J. David Bleich wrote on the topic in Tradition 11:3. 2. As someone who spends a lot of time on "Gd matters", I am concerned about desensitization to what Torah really means, what it's "about", so I take extra steps to try (not always successfully) to remind myself that Judaism is not my career, it's my religion. I try to be careful about conversing in a shul or beis medrash, for example. I don't use the Name in songs on Shabbos, although I believe it is entirely permissible. This spelling is another example. 3. The fourth perek in Pesachim teaches that one may not permit that which people normally prohibit (דבר שהציבור נהגו בו איסור). Certainly, there must be boundaries to this, for this maxim cannot be sanction to perpetuate every foolish trend to pop up, but I do think it applies to well-meaning practices which are designed along halachic lines and don't overburden the community. My questioner also noted the halachic principle of "אין לדבר סוף", that we do not create decrees which will create endless problems. As an example: The kohen gadol of Yom Kippur is supposed to be married, but, per the beginning of Masechet Yoma, we did not establish a 'backup wife' in the event that something happen to his wife just before Yom Kippur, lest we then need backups for backups. However, I'm not sure that this case qualifies. אין לדבר סוף is a concern for creating obligations which cannot be met because they are too broad in scope. The kohen gadol's wife is a perfect example - Once you require a second backup, you require a millionth backup automatically. On the other hand, here the law would apply to any word created to refer to Gd, but the scope depends on the number of words you invest with that meaning. So those are my thoughts on the topic. What are yours? I'm going to take a stab at explaining something about myself which really bothers me; based on R' Kluger's observation, I'm pretty sure others do it, too. I hear about a tragedy on the news, let's say a shooting, and it hurts. But then I hear that the victim was in trouble himself, was involved with a gang maybe, and it hurts a little less. Take the collar bomb story from a while back, and the FBI's determination that the victim was in on the plot at the beginning – oh, then I guess that's not so bad. Or a man comes to my door collecting for tzedakah, and he describes a heartrending situation. He has ten children, his wife is ill, his parents are ill, the family has great debt and he needs help to marry off his daughter. I can see his bad teeth. He has letters vouching for his authenticity. I want to cry, to pull out my wallet and give him whatever I have. But then I ask him what he does for a living, and the answer is that he sits and learns. Oh, wait a minute, some part of me says. Then I don't feel quite as sympathetic. I could give many examples of practical wrongs or ethical wrongs or halachic wrongs we diagnose, consciously or subconsciously, as reasons for others' suffering: They built their homes near a volcano, they got involved with drugs, they opted not to go to college, and so on. They broke Shabbos, they engaged in illicit relations, they laundered money and defrauded the government. These calculations are often correct, from a logical standpoint, but on some level they are a defense mechanism. They come to make me feel less guilty about not helping, to make me feel less guilty for putting these people out of my mind and going about my life. This is what R' Shlomo Kluger (grandson of the more famous R' Shlomo Kluger) saw in the actions of the righteous people of Kfar Sakhnia, who did not mourn for Yerushalayim (Gittin 57a). Those righteous people identified, as the gemara (such as Shabbos 119a) does, the sins of Yerushalayim: Failure to rebuke, lack of shame, disrespect, failure to educate their children in Torah, and so on. They saw reasons for her suffering, and accepted the resultant devastation as Divine will. And then they saw no reason to mourn - and this was, itself, a grave sin. Finding explanations for our own suffering is appropriate, and if they reduce the pain then so much the better. Finding explanations of the suffering of others, to understand a cause and effect, to educate myself about proper behavior, is an obligation of my religion. But using those explanations to numb my sensitivity, to fail to feel their pain, to fail to go to them and embrace them and cry with them – that's just wrong. חטא חטאה ירושלים, said Yirmiyah. Yerushalayim has sinned. Guilty! But I am obligated to cry and fast and sit on the floor and feel pain in her pain, nonetheless. Her pain must be my pain. Please! May this be the last Tisha b'Av on which we mourn. Immortality: Is it bad for religion? Back in February, Time ran a cover story on Ray Kurzweil's prediction that technology will cure aging in the coming decades. This evolution wouldn't actually equal immortality – plagues could erupt and take a toll before being brought under control, and people could die from physical trauma. Nonetheless, it will come as no surprise to you, if you've read any of my six previous posts labelled General: Death, that the idea of even this immortality-lite existence fascinates me. I wonder: Would this form of immortality make religious practice weaker or stronger? Well, "religion" is a big place, so let's refine that: Would it make Judaism weaker or stronger? My first thought is that immortality would weaken Jewish practice; many people embrace religion in a search for attachment to something larger than their own limited existence, or out of fear of what happens 'next', but in an immortal existence they would feel less pressure to opt for religion. On the other hand, it might actually strengthen Jewish practice: One of the disincentives of Judaism is the heavy demand it places upon people's time, and the fear that observing mitzvot will translate into lost opportunities for fun and pleasure. Once we find the Fountain of Youth, though, the pressure to enjoy the moment dissipates. Further, people whose lives are limitless might feel a greater push to find meaning. In a brief existence, there is relatively little time available for introspection. Extend life by a few centuries, and perhaps more people to stop to think about why they are here. Those are just beginning thoughts. What can you add? This is my article for this year's Tisha b'Av To Go (and an upgraded version of an article I first published here). Comments welcome. Some twenty-five hundred years ago, on the ninth of Tammuz, the walls of Jerusalem were breached by the Babylonians. Or, perhaps not. In the fourth month, on the ninth of the month, the famine strengthened in the city and there was no bread for the population. And the city was breached and the soldiers fled, and they departed the city via the gate between the walls by the king's garden, with the Chaldeans surrounding the city, and they traveled via the aravah. There is no problem; Yirmiyahu spoke regarding the first Beit haMikdash, whereas in the time of the second Beit haMikdash the city was breached on the 17th of Tammuz. A braita corroborates this, saying, "In the first Beit haMikdash the city was breached on the 9th of Tammuz. In the second, on the 17th of Tammuz." The Tur and Shulchan Aruch (Orach Chaim 549) cited Rava’s view as law, explaining that we fast on the date of the second breach of Jerusalem because the destruction of the second Beit haMikdash is more severe for us. Rabbi Tanchum bar Chanilai said: I see a corruption of calculations here… Whether taking the view that the walls were breached on the 9th of Tammuz, or taking the view that the walls were breached on the 17th of Tammuz, there were 21 days from the time the city was breached until the Beit haMikdash was destroyed… The one who said the walls were breached on the 9th of Tammuz took the view that the Beit haMikdash was destroyed on the 1st of Av, and the one who said that the walls were breached on the 17th of Tammuz took the view that the Beit haMikdash was destroyed on the 9th of Av. According to Rabbi Tanchum bar Chanilai, the walls of Jerusalem were breached on the 17th of Tammuz and the destruction of the Beit haMikdash actually took place on the 9th of Av, and the Jews of Bavel remembered that twenty-one days had passed between the invasion of Jerusalem and the fall of the Beit haMikdash. Therefore, when they incorrectly set the destruction of the Beit haMikdash as the 1st of Av, they dated the invasion as having occurred 21 days earlier, on the 9th of Tammuz. All of the above leads to a simple question, though: Granted that the beleaguered population might have been confused, why did the Sages canonize inaccurate dates? Can it be that these texts, canonized as prophecy, are simply inaccurate? אנשי אותו הדור בבבל לא האמינו זה, ונתיאשו... אנשי בבל שמעו מהנביאים שלהם "ביום א' לחדש שמח צור במפלת ירושלים" והם לא הבינו כי ט' אב נקרא א' בחדש על "כי תם עונך", על כן חשבו כפשוטו כי ביום ר"ח אב נשרף בהמ"ק וחשבו כ"א יום למפרע לבקיעת העיר ויהיה ביום ט' תמוז. That generation of Babylonians did not believe this [that once the Beit haMikdash was destroyed, there was hope for redemption]. They gave up hope… The Babylonian Jews heard from their prophets, 'On the first of the month, Tyre rejoiced at the fall of Jerusalem,' and they did not understand that the prophets called the 9th of Av 'the first of the month' because of the prediction, 'Now your sin is complete [and the redemption can begin].' They thought it was to be understood literally, that the Beit haMikdash had been burned on the 1st of Av. They calculated 21 days back, and figured that the city had been breached on the 9th of Tammuz. The destruction of the Beit haMikdash fulfilled Eichah 4:22, “[The punishment for] your sin is concluded.” Once the building was demolished, we entered a new world of consolation and re-birth, and so our leaders dated the destruction as the first day of a new month, and indeed a new era. The nation took this literally, dated the fall of the Beit haMikdash as the 1st of Av, and back-dated the fall of Jerusalem as the 9th of Tammuz. Chatam Sofer’s suggestion that the Sages would have risked calendar havoc is stunning in its presumption. Judaism views the calendar as sacrosanct, the very purpose of the creation of the celestial spheres; “He created the moon for the sake of the appointed times,” King David sang in Tehillim 104, building on Bereishit 1:14. We set our halachic lives by our days and months. Our first national mitzvah was the system of calculating the lunar month. And yet, Yirmiyahu and Yechezkel felt comfortable feigning re-setting the clock, in clear defiance of the physical moon and the halachically infallible justices of the beit din, for the sake of making a philosophical statement about the new era we had entered! This bold approach should highlight for us the importance of launching new beginnings immediately after catastrophe. The sky is still filled with soot and ash, parades of chained Jews shamble out of Jerusalem, looters are stuffing elegant gold and silver into sacks – and the prophets have the hope-filled hubris to declare, "Today is the first day of the rest of your national life." This must serve as a guide and inspiration for us; if it is always darkest before the dawn, then the moment after our darkest despair is always the start of our new day. May the value of our mourning up through Tishah b'Av, and our efforts at consolation in the new era born thereafter, merit the immediate rebuilding of our Beit haMikdash. But if harm comes upon a person and upon others… then that person, who may even suffer more than others, may not calm himself and avoid feeling the pain of others… saying that he accepts it upon himself with love. This is a repugnant trait and an ugly path; one may not accept with love the ailment, pain and trouble of others! One who does so is subject to the curse of our sages, "When Israel is in pain and one of them separates from the community, two ministering angels place their hands on his head and say, 'So-and-so who separated from the community shall not see the comfort of the community.'" It is as they said regarding Kfar Sakhnia… Once the Sages themselves testified that these people were fully righteous, how could they not have mourned for Jerusalem?! But this is what we have said: They, like all of Israel, felt the great, overarching damage from the destruction of the place of the house of our Gd, but because they were righteous they rallied themselves and restrained the storm in their spirit, they overcame their sorrow, and they accepted it all with love. This is why they were punished – for the pain and mourning of others, they ought to have torn the seal of their heart, to have mourned and poured forth tears! I’ve been unusually depressed lately - beyond the normal dips and bottoms in my normal state of harried/anxious/depressed/exuberant. Some of it is the Nine Days. Some of it is miserable anticipation of Haftarat Chazon coming up this Shabbos; I never get through that without bawling like a baby. Some of it is from lack of music during the Three Weeks of mourning. And some of it is the rising tide of illness and bereavement I’ve been dealing with, in one of those morbid swings of the pendulum that happen from time to time. I began receiving letters from people on the verge of suicide, asking me for help - help they felt for some reason I was qualified to give them. I wanted to answer these lettes before the people carried out their acts of despair, but after I struggled with what I should say in answer to the first letter I received, I realized I had taken a week. That was too long. At a certain point, even the right words might be useless. I couldn’t take that long with every letter. Finally, I wrote a draft of a note that could be tailored to anyone who wrote me in desperation, and I checked it with a friend who was a psychoanalyst. In each letter, I included the number of the local suicide prevention clinic. I tried to make the letter seem personal and genuine, hoping they wouldn’t choose a permanent solution to a temporary problem, but each time I sent out one of these letters, and there were a number of them, I felt strange. This is what getting famous does to you, I though. You wind up sending suicidal people form letters. That’s a big problem in the rabbinate. Members, non-members, locals and people from far away, they come to you looking for answers, for comfort, for a listening ear, and you can’t afford to send them form letters. They need, they deserve, more than that. They deserve someone who will listen. Real listening is a willingness to let the other person change you. When I’m willing to let them change me, something happens between us that’s more interesting than a pair of dueling monologues. Like so much of what I learned in the theater, this turned out to be how life works, too. To be a good listener means to be transformed: To sit and listen and absorb the other person’s experiences and point of view, and let them become your own, so that you can respond with a real sense of the other person. You can’t have an answer until you know what the other person is saying, until you’ve heard him out and absorbed her view. I’m experienced enough to know the danger this poses during an intense period like the one I’m enduring. I know the warning signs and the pitfalls, and the need to step back and take a deep breath. But I’m a rabbi. I’m the rabbi. They come to me. This is one of the reasons I don’t blog much about the “big issues” facing the Jewish community. All community is local; it’s the woman with cancer, the man with suicidal urges, the couple having marital difficulties. What Olmert will and won’t do, whether Lubavitch messianists are going Christian or not, asking if the Gedolim are given too much credence - I don’t have the patience, let alone the time, to play pundit on that these days. I’m trying too hard to avoid sending suicidal people form letters. I'm looking at some fun ideas for classes for next year - Professional development for lawyers, an executive forum for business leaders, a program on Spirituality I call "Hitoriri", a responsa-based halachah series, and lots more. I had a very stimulating meeting with a Hillel professional last week, in which we discussed his approach to campus work. It was an eye-opener, taking things I've seen and extending them farther, in ways I hadn't imagined. It's now just about five years since I started my first, now defunct, blog. This blog passed 200,000 page views some time in the past two weeks. And I'm planning a one-week trip to Calgary for after Tisha b'Av, first vacation since, well, last August. So there are things I could/would/should blog about. But I just don't have it in me right now. Bein haZmanim (kollel intersession) just started, so my time is more flexible, but I still have 20 things on my daily to-do list... I spent 5 hours between Friday, Motzaei Shabbos and Sunday on a failed Joomla upgrade for the kollel website (no, we don't have an IT guy)... and the Nine Days period always has a deadening effect on me. I hope to write soon, but no promises.